Halifax Canoe Club proudly presents the Sleningford weekend for 2018. Two nights Camping, numerous paddling sessions and plenty of laughs all in the gorgeous surroundings of Sleningford Watermill Campsite. Under the expert River guidance of Andrew Livingstone we will hosting a Saturday River trip, sandwiched between our traditional Friday night play on the River at the camp site and probably an early morning Sunday play too. This is the one for me, what do I do next ? The campsite isn’t open for bookings until 1st March 2018, but you can still stick the dates in your diary, drop me an email to give me an idea of early numbers and check that your tent is complete – I wouldn’t want anyone to turn up to a Campsite and find they’ve left their Poles at home. Tents and Caravans are welcome and the self catering cottage is available (at the time of writing this ). When booking your pitch , you must specify the Halifax Canoe Club group link to ensure that we all get allocated together on one of the Camping zones. I`m fairly new to River paddling, can I come ? 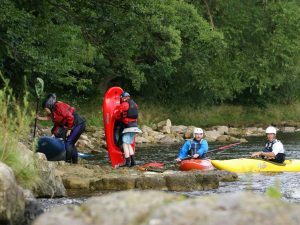 The predicted River trip on the Saturday is mostly “flat water” with a few weirs, so should be suitable to beginner paddlers who have completed our Beginner classes but please give me a bell or drop me an email to discuss this before paying a deposit for the Campsite. Usual paddling kit, kayak, Open boat if you prefer, usual camping stuff , portable bbq`s are welcome, FIRELOGS ARE NOT. You will be self sufficient for your meals.